Despite our recent appearance as co-commentators last week, Chief Justice John Roberts has spoken against my proposal to expand the Supreme Court to 19 members. According to the Washington Post, Roberts said that he opposed the proposal and added “Well, I suppose it depends on who gets to pick them.” For prior columns on my proposal, click here, here and here and here. (See also Unpacking the Court: The Case for the Expansion of the United States Supreme Court in the Twenty-First Century.” 33 Perspectives on Political Science, no. 3, p. 155 (June 22, 2004)). 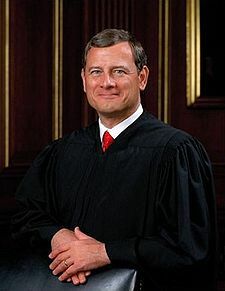 Unfortunately the full remarks of Chief Justice Roberts (if there were any) are not given in the article. However, the brief comments noted do raise a couple of common objections and an opportunity to address them. First, it is worth noting that my proposal calls for the additional justices to be phased in with no more than two new justices being selected in any one term. Thus, the expansion would occur over twenty-four years. There is no basis to assume that a conservative or a liberal — let alone a Republican or a Democrat — would select most of these nominees. The answer to Chief Justice Roberts on who will select the nominees is simply this: between 3 and 5 presidents. The even shorter answer is “the same folks that who picked you.” I am always struck how arguments against expansion would easily bar the current system. Nine is an arbitrary number and yet using the average size of appellate courts (en banc) and high courts of other nations is attacked as arbitrary. The current Court members were selected by different presidents and Senates and yet the same selection process is somehow suspicious for additional justices. Second, I did not expect the current occupants of the Court to eagerly embrace a proposal that would dilute their current power. In his favor, I am sure that Roberts does not view this as a threat to his own power or those of his colleagues and that he simply feels that it works fine with nine. He has a great love for the Court both as a former litigator and the current Chief Justice. It is hard to break away from something so familiar, particularly in an institution that is revered by many. However, as discussed in the prior columns on my proposal, both en banc appellate courts and the high courts of other leading nations offered a better model for the Court with less of a concentration of power. Like a conventional monopoly in the market, I do not expect current holders of these positions to be thrilled with adding 10 more justices and viewpoints on major cases. However, the recent decision on health care in my view vividly shows the dysfunctional aspects of a nine-member court. Indeed, this was the reason that the Washington Post ran the piece two weeks ago. As discussed in that column, it was likely that the decision would be another 5-4 opinion though experts divided on how the decision would come out. As stated in the column, it doesn’t matter. It is not the ultimate result but those deciding that is the focus of the proposal, which was made over ten years ago. Health care should not come down to just five justices, in my view. Clearly, we would continue to have concurrence and dissents on a larger court, but these individual or two member opinions have a pronounced impact on the smaller court. Currently, if one or two justices depart with their own opinion, it can result in a plurality opinion or throw the rationale for a holding in doubt. The ruling in the Stolen Valor Act case (Alvarez) is a good example. While the case was (thankfully) decided by a 6-3 margin, two justices (Breyer and Kagan) filed a concurrence suggesting that a lower standard of review of intermediate scrutiny might apply in cases of false speech. It is the type of slippery slope problem that the free speech community abhors. Most of us in that community believe that free speech requires a bright line rule that avoids such ambiguity. However, with just two justices departing (even from a six-justice majority), the meaning of the opinion can be questioned with only four justices supporting the bright-line rule. The report of the effort by Justice Kennedy to lobby Roberts after he switched sides in the case also shows the dangerous concentration of power on the Court. The entirety of the health care matter turned on just one justice. In the end, I was critical of his opinion as internally conflicted and inimical to federalism. While I respect his commitment to his own views regardless of the consequences, the rationale for this sweeping case rested with one justice. There is a curious argument making the rounds that Roberts switched his vote to simply show that the Court was not ideologically driven. I hope that that is not true. It would in my view be unethical to vote on a matter of constitutional interpretation against one’s own views just to achieve a political objective for the Court. Last night on CNBC, I told the hosts that I would not assume the worse about Roberts in such a motivation. Ironically, not only do I believe he voted his conscience, his vote did not show unity or a break for ideology for the Court. He simply switched a 5-4 ruling to the liberals, who did not join in his rationale. Finally, I do not subscribe to the view that there is something untoward in justices maintaining their jurisprudential positions on issues like federalism. Just as the liberals have a broad view of federal authority, the conservatives have a strong view of federalism. I would not want either side to abandon such views to achieve the appearance of unanimity or collegiality. These interpretations have meaning and importance. I would not view such artificiality as a “triumph” for the Court. As for the expansion reform, I believe last week objectively shows the dangers of a court that is demonstrably too small in my view. People (including the Chief Justice) can differ. However, my main point is that we should have this debate. We have never discussed the optimal size of the Court. Once again, it does little to ask: why not 29 or 99? Our current number was largely the result of historical accident. I could just as easily ask why not 3 or 6. The point is that we should be able to discuss the optimal size or range civilly and objectively. Finally, I wanted to note again that the reason for 19 justices is not just the average size of the courts discussed but also the interest in having 2 justices each year sit by designation on lower courts — returning to a worthy tradition in this country. That will also not go over well with the current members (any more than my proposal for televising arguments). However, this is a debate that belongs to all citizens and not just the current occupants of the Court. can i makle midi’s with a cheap digital keyboard by just plugging it into a computer and using a special software? or do I have to get a midi keyborad?. No one has said free or nearly free. The contention is that private for-profit health care insurance is a parasite upon the system that jacks up prices and denies coverage in the name of profits, i.e. profits are taken unjustly and disproportionately and siphoning off money that could be and should be spent on patient care, not perks and ridiculous executive compensation. One way to do this is to socialize health care insurance and make it operate on a not for profit basis. Another way to do this is to mandate maximum profits on health care insurance. Either way, the solution is antithetical to your laissez-faire ideology which offers no solution at all and has indeed been the driving force behind the malfunctions and inequities of our current for-profit health care insurance model. ” I would be an advocate of repealing those laws that cause quality healthcare to be unafordable for the majority.” There are no laws keeping health care unaffordable for the majority, skip. There are only the profit motives of insurance companies keeping health care insurance unaffordable for the majority. Your myth that deregulation is a panacea strikes again. Thank you for the article on Japanese health care. I find one statement there curious in view of your thesis. In the first paragraph the author writes, ” It [Japan] does so by banning insurance company profits, limiting doctor fees and accepting shortcomings in care that many well-insured Americans would find intolerable.” I find that statement the antithesis of capitalism. Do you subscribe to socialized health care but capitalistic markets elsewhere? @mespo727272 — I’m am not an advocate of socialized medicine. I would be an advocate of repealing those laws that cause quality healthcare to be unafordable for the majority. I believe that socialized medicine is only a patch for a much deeper and larger number of social problems, facing our society, so I can’t truthfully say that under the current system I’m really supprised that so many people want almost free healthcare. Just remember from many years of analysis of this subject, I generally believe that you get what you pay for. A hundred bucks a year is virtually free. Ask any child or woman if they want something for free, and you will probably get a 95%, yea man but somebody has to end it paying for it. It is always the negative ramifications that gets us into trouble and we just aren’t really willing to honestly address those issues. You see what is happening at this moment to a number of very socialistic countries in the EU as there is no longer enough producers to pay for the costs of government. So they keep on throwing more fiat currency at the problem, therefore debasing their money without really solving the underlying problems. The long term results of socialism are always catastrophic for the majority for primarily that reason, so it will be interesting to see the time line as things unfold. It is much easier to pass bad laws than it is to repeal them. “As the U.S. reenters a recession, you might want to consider the future economic consequences of socialism on our society. Some have even coined the phrase “The Great Recession”. Well, the Great Depression was a direct result of unbridled capitalism, so it seems the economic system chosen has little to do with the occurrence of recessions or even depressions for that matter. I found nothing in Article IX that gives you or anyone else the right to be a free rider on the US healthcare system. Everyone invokes the joys of “capitalism” when policy works in their favor, or calls the policy “socialism” when it doesn’t. Labels aren’t really helpful. @mespo727272 — You are erroneously assuming that I want to be a free rider on the U.S. Healthcare system. Why would I want to be a part of a system that is 43 in the World in health. http://www.washingtonpost.com/wp-dyn/content/article/2009/09/06/AR2009090601630.html – This is a pretty balanced article on Japan’s system. Japan ranks first in overall health and you can read about their strengths and shortcomings as it is very similar to waht I think this new healthcare law will create. However Japan is a lot more holistic in their medical practices where the U.S. is dominated by allopathic practisioners. Remember that Japan has been in a recession for almost 15 years. As the U.S. reenters a recession, you might want to consider the future economic consequences of socialism on our society. Some have even coined the phrase “The Great Recession”. However as Cities and Counties continue to default on their liabilities and as commodity prices continue to rise over the next 5 years, you guys are going to have to rethink your strong inclinations to redistribute wealth and why it has never worked over long periods of time. Our system is unsustainable. Thinking that you can alter behavior by force has been a very dangerous experiment. If the Court were made up of 19 Justices and the vote was tied at 9 and 9 then one Justice would decide the case. Just like now. Sides. Changing sides. Which sides? The Liberals are not always the Liberals and the Conservatives are not always the Conservatives. Look at the case of: Michigan v. Bryant No. 09-150, 2010 term. Confrontation Clause where Scalia and Ginsberg are in dissent standing up for the rights of the defendant. To be clear, although I discuss it in terms of motive, ultimately motive proper is irrelevant in light of effect. Yes, But I’d still like to understand his motive and/or his rationale for going where he did. His motive would give a pretty good clue to his character. I’m very skeptical of his character and would like good evidence that I’m wrong. In terms of effect, I see the mandate as a gift for insurance companies, a natural fit for his demonstrated pro-corporate bias. There’s been discussion that it’s a detriment to federalism but, honestly, I don’t really understand what that is or how this decision erodes it. Is it basically a concept of states’ rights and this decision has the federal government superseding them in a precedent-setting way? Maybe a smoking gun re: his motives will appear but I won’t hold my breath. I do know that I had preconceived ideas about voting and could make arguments for my choices. I was presented with a difficult to understand argument for an alternative. As I was preparing my arguments to this different approach I realized that I was wrong and did a turn-about. Literally, mid-sentence near the end, I had an Oops! doesn’t work. Did a reassessment and finished with support of the argument that I had, minutes early, rejected. So instead of arguing against the proposal, as I would have been prepared to do, I now support it. Elsewhere I mentioned IRV – that’s Instant Runoff Voting. It’s all there (my brain). It just takes awhile to find sometimes. How quiet it is. No new blawgs. No comments. Weird. Don’t tell’em man, that dood had forgot this is the Cinderella hour. The USA Independence Day. When blawging is forbidden, commenting is forbidden, and only a limited number of activities in thís universal expressioon of patriotism. So to the others I say, keep manning your barbecues, don’t let the small ones drink “lighter” fluid, especially if they want to spit it on the fire. And keep’em loaded. You never know when a terrorist, or some “crimnul” might attack your csstle. I’m trying to rmemember something appropriate to end with a real tribute—but the image of George saying “Mission accomplished” on the carrier deck keeps interfering. Some epiphanic moment to reflect on in thanksgiving? Not a one. Guess my birth will have to do, but that’s kinda hazy now. So anyway, Happy Fourth! That’s bigger than a fifth! I think it is a great idea to expand the S.C. What I’d like to know is how they pick cases to hear. Don’t they get like 11,000 petitions a year? People do so much work and spend so much money and then their work and their hopes are just thrown in the trash.